Erickson, Enloe "Doves of Peace"
THE STORY: In 1986 the students at the International School in Hiroshima, the international city of peace and culture, decided that with a new school facility they needed a new sports team mascot. The middle school kids were in charge and began collecting names that included The Nosepickers, The Curtains of Steel, and among many others, The Nukes and the A-Bombers. That last suggestion came from a young person from Richland, Washington, home of the Hanford Nuclear Works where the plutonium for the Nagasaki Bomb (“Fat Man”) was developed. The Bombers’ logo, an image of a mushroom cloud, was found throughout Richland high school: on the floor in the foyer to the school, on the water tower overlooking the football field, on the outside wall of the gym, and on the letter jackets of the players and sweaters of the cheerleaders. The kids were adamant that the A-Bombers was their first choice. I asked them to speak with two of our beloved staff, Mrs. Nobori the school’s bookkeeper and Yaguchi san, our building engineer and chief bus driver. Both were hibakusha (A-bomb victims), Mr. Yaguchi being fifteen years old at the time of the holocaust. Mr. Yaguchi met with them and asked what would be the reaction of Japanese citizens if they walked down the main street in the City wearing letter jackets emblazoned with Hiroshima International School A-Bombers and a mushroom cloud. He told them of his own experiences and the recurring nightmare from that fateful day years earlier, of walking among the charred dead and dying with no way to help as they cried for water. Over the next week students talked among themselves and met again with Mr. Yaguchi and Mrs. Nobori. Many of them had second thoughts about the name and logo. 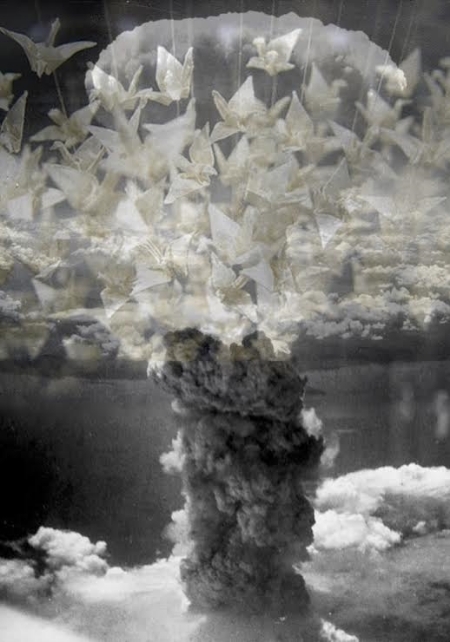 Mr. Yaguchi gave them a sketch he had made- a black and white mushroom cloud covered with doves of peace. This might be acceptable he suggested. The students had initiated their world-wide Thousand Crane Club the year before and his idea gained lots of support. But in the end they chose the Sea Hawks, the graceful birds that circled the estuary and Inland Sea below the school. This image of Time of The Doves is in honor of Mr. Yaguchi, Mrs. Nobori and those students.